Four Gentleman had a big opportunity to gain ground on the leader and defending champion, DStars45; while he was on vacation. Only one Gent truly took advantage and that is the unheralded t3bird04. 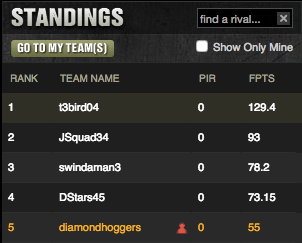 “The Family Man of DFS” as he is affectionately known as within the industry put up an impressive 129.4 points on Friday night to take home the grand prize and the five points in the standings. You see, while we are all running around wondering about which whores we will bring to the luxurious Friday night event every week, the bird man simply does the right thing and brings his wife. It is fitting that on this mother’s day weekend, he can boast to mama and wife while we all tuck our tails and try to think of a better way to succeed against his advanced mind. Bird has Zach Greinke to thank for his big win, along with Joey Votto, David Peralta, Roughned Odor, and ALEX FRIGGIN PRESLEY! Nice play on Presley. I was the only other gent to use Greinke; but I paired him with the turd of the week, Taijuan Walker. More on that later. 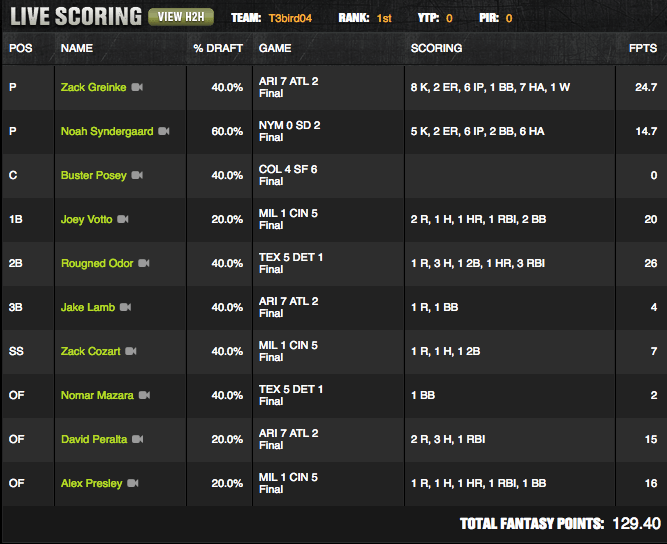 Three gentleman used Noah Syndergaard, and for his price tag the 14.7 points he brought home was not rewarding. Except for our own t3bird that is. Here’s a look at where the standings sit heading into the teeth of May. I had to include this little exchange on our GroupMe chat. We began talking about Taijuan Walker leaving the game after just two innings in Houston. Aw, isn’t that cute? He wasn’t feeling quite right but no worries, he’ll be out there for his next start when we can’t use him to throw eight strong innings. 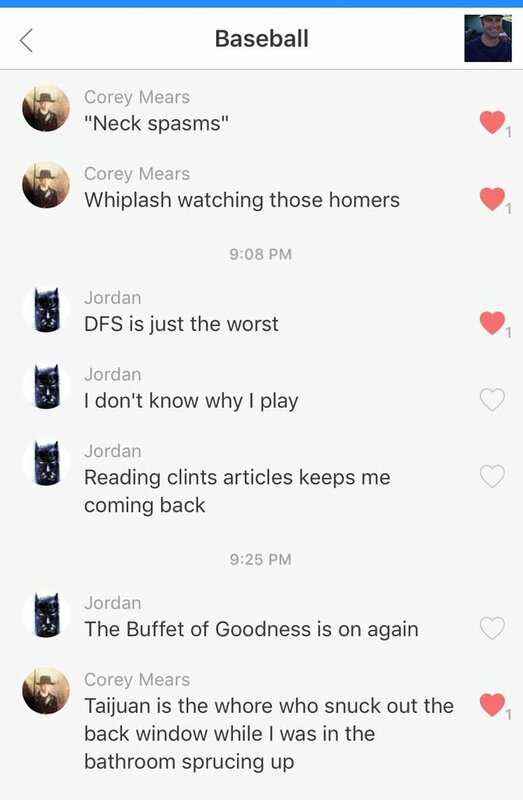 But the real gold in this exchange is JSquad34’s rundown on DFS in general. It is truly, just the worst. I will only continue playing for this great honor of going to battle against these four gents. And for this article. So what will happen next week? Will t3bird04 and his wife leave the event early for a safe night in while the other four gents chasing their whores around the Gentleman’s Game Mansion? Will I find a way to again score 55 measly points? There will be one gent alone in last next week…. what will his name be? I wouldn’t want to be that gent, but the reality is I very well could be. You must stay tuned to find out.